You can trade Vanguard ETFs free of commission in Vanguard brokerage account*. However, opening a Vanguard brokerage account seems to be a tricky process. The non-retirement brokerage account is considered as a "general savings account" which has to be linked to a Vanguard mutual fund account. Do you have a regular, non-retirement brokerage account with Vanguard? If you do, do yo still remember the account opening process? I just opened my first Vanguard non-retirement brokerage account and I found the whole process wasn’t straightforward and the experience wasn’t a pleasant one. Yes, I have been a vanguard customer for more than 10 years and currently have a number of accounts with them. But all those accounts are retirement savings accounts, IRA, Roth IRA, and SEP-IRA. After recent adjustments I made to how we invest our money (which I will talk about in detail later), I decided to open a Vanguard brokerage account so that I can buy some Vanguard ETF shares. We have already known all the advantages Exchange-Traded Funds (ETFs) have over traditional mutual funds, such as increased flexibility of trading and lower costs. An additional benefit of buying Vanguard ETFs using a Vanguard account is that all the transactions are commission free. Since ETFs are traded just like individual stocks, buying and selling ETFs usually involve commissions paid to the broker with which the transaction occurs. For example, let’s say that I want to buy 100 shares of Vanguard Materials ETF (VAW). 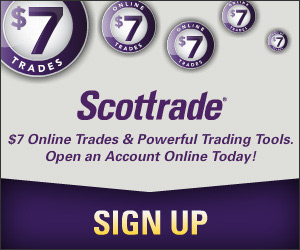 If I purchase the shares through my brokerage account at Scottrade, then I will have to pay a $7 commission for the transaction. $7 is not a lot of money compared to the principle, but it’s still a fee I want to avoid to pay if I could. This is the case with almost any other brokers, the only difference is the amount of commission paid. However, with Vanguard, the commission is waived entirely when trading Vanguard ETFs, whether it happens in a regular brokerage account or retirement account. Since I am shifting away from actively managed mutual funds to low cost index funds, especially ETFs, it makes all the sense to get a Vanguard brokerage account and trade Vanguard ETFs from there without paying any commission. Add a new brokerage account using your existing Vanguard information: Buy and sell stocks, bonds, ETFs, CDs, and non-Vanguard mutual funds. You’ll use existing mutual fund account information to open the new brokerage account. 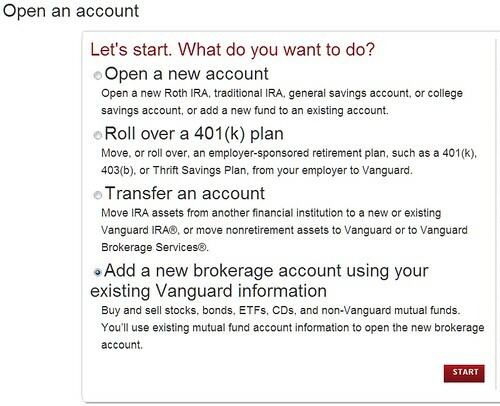 Since all I want is a Vanguard brokerage account to trade Vanguard ETFs and the account is not an IRA account, not a general savings account (seriously, I didn’t know what this really is and it doesn’t appear to have anything to do with a brokerage account), not a college savings account, and I certainly didn’t want to add a new fund to an existing account, so I figured that the last option was the one I should use because I want to open (or add) a new brokerage account to buy and sell ETFs, and I can use my existing Vanguard information for this new account to save me some time during the opening process. I went ahead with the last option and following the steps I was asked to select an existing account as a reference for my personal information. All my existing accounts, SEP-IRA, Rollover IRA, Roth IRA, were listed. To me, there wasn’t any difference among those accounts as far as my personal information is concerned, I simply selected the first one in the list, SEP-IRA, and continuted to finish the process. Well, guess what, the next day when I logged into my account again, I didn’t see my regular, non-retirement brokerage. Instead, I got another SEP-IRA brokerage account!!! That’s not what I wanted. So I called Vanguard and asked why. I explained what I did and was told that I should use the first option, Open a new account, instead of the last one. I told the representative that I wanted a new brokerage account to buy ETFs and the first option didn’t say anything about brokerage account or ETFs, and the last option appeared to be the only valid option to get what I wanted. Then the representative told me that the general savings account in the first option is what I needed to choose in order to open a regular brokerage account. General savings account? Brokerage account? I really had a hard time connecting the two together, but that’s what Vanguard calls it. The thing is at Vanguard, I can’t really just open one brokerage account alone to buy ETFs. Any Vanguard brokerage account has to be linked to another account, retirement or non-retirement, existing or new, which needs to be funded first. When purchasing ETFs, money will be swapped out of that account to the brokerage account to the transaction. In my case, since I didn’t have any existing account to link to the new brokerage account (and that’s the mistake I made when I used my SEP-IRA account as “reference”), I ended up getting two accounts instead of one: a “general savings account” which holds Vanguard Prime Money Market Fund as funding source for the brokerage account, and the actually brokerage account that holds the ETF I purchased. Sure, Vanguard has some awesome products, but I don’t understand why they make such a simple process as opening a brokerage account against intuition. I have opened many brokerage accounts with different companies before, and this was the first time I actually failed. 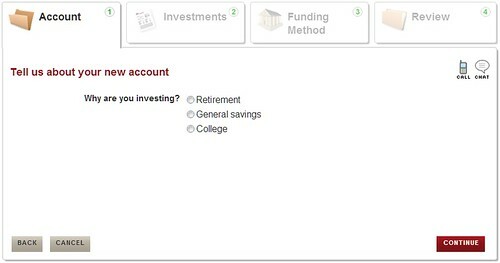 I mean, I could never make the connection between what was shown to me, general savings account, and what I want, a non-retirement brokerage account, and I don’t see the necessity of having two accounts to make it work. Why can’t this be a little simpler or, at least, clearer? Did Vanguard get rid of their account maintenance fees. They were charging me $30 /year. I don’t think there’s an account maintenance fee at Vanguard. Maybe there was one long time ago, but definitely not now. Move Brokerage Account from Scottrade to TradeKing?